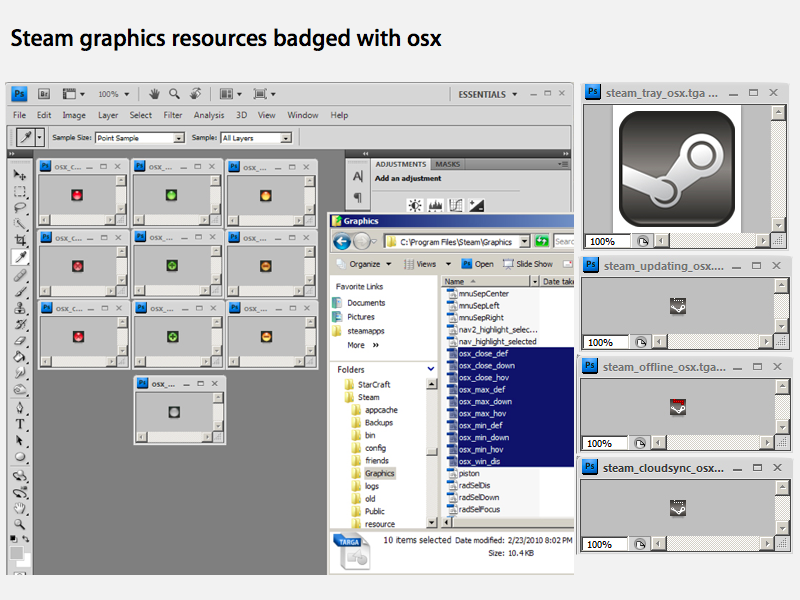 Users have discovered Mac OS X specific files hidden in the latest version of Valve Software's Steam distribution engine and multiplayer platform for gaming, indicating a Mac port may be around the corner. Earlier this week, Steam's discussion boards lit up after users found graphics and menu item resources (below) in its latest update which were apparently designed for Mac OS X. 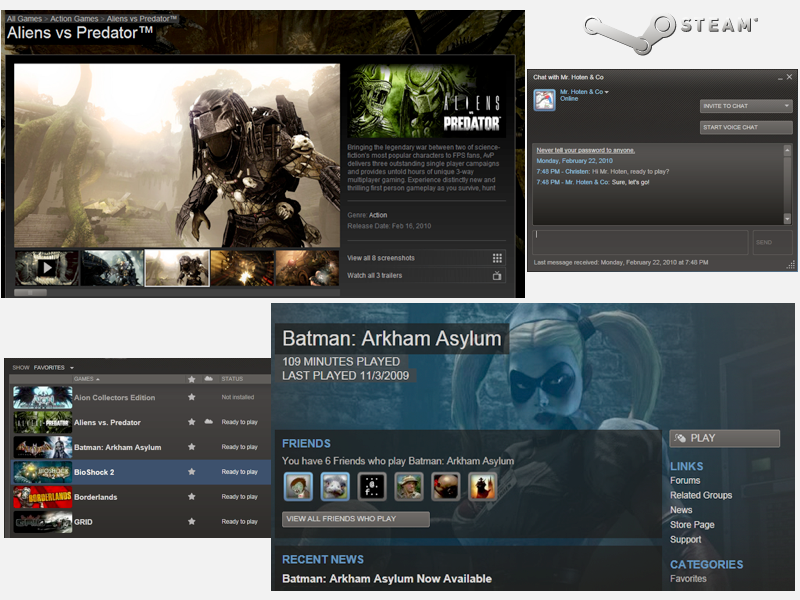 Steam is currently Windows-only, but it represents a variety of third party software publishers that support Mac versions of their games, including EA, id Software, PopCap, and Take-Two Interactive. Valve, Steam's developer, also creates its own first party games including the popular Half-Life 2, but has not yet ported its own games to the Mac. Back in 2007, Steam's co-founder Gabe Newell detailed his company's interest in working with Apple to support the Mac, but pulled no punches in criticizing Apple for not following through with the kind of support game developers needed. "We have this pattern with Apple," Newell said in an interview, "where we meet with them, people there go 'wow, gaming is incredibly important, we should do something with gaming. And then we'll say, 'OK, here are three things you could do to make that better,' and then they say OK, and then we never see them again. Apple's stance on gaming for the Mac platform hasn't changed dramatically since then, with most attention being directed to the delivery of Windows games for Intel Macs using TransGaming's Cider engine. However, with the iPhone and iPod touch, Apple has created a new mobile platform that has attracted lots of native development from leading game developers. The iPod/iPhone halo has also helped the company to dramatically ramp up sales of Mac systems. Combined with the Cider engine (which enables game developers to release their existing Windows code in a way that works on Intel Macs), this makes targeting the Mac platform increasingly attractive for PC game developers even without extensive support for native development from Apple. Steam works similar to Apple's iPhone App Store within iTunes, providing a market for PC video game titles and a mechanism for automatically delivering the latest software updates to players. Additionally, Steam also presents community features including user profiles and both private and group in-game chat services. It also delivers a multiplayer gaming environment that polices the use of cheats to keep players all on an equal footing. Valve's latest software update for Steam introduced a new user interface (below) and dropped Microsoft's Trident rendering engine from Internet Explorer in preference for the open source WebKit engine Apple uses. John Cook, the Director of Steam Development at Valve said this move "gives us a bunch of size, stability and performance benefits. This release of Steam leaves us well prepared for another year of strong growth."